Technology is evolving at breakneck speed taking businesses along for the ride and helping them to grow their brand faster than ever before. A productive and successful business is one that chooses its technology wisely and ensures the necessary support mechanisms are in place to deliver round the clock availability. The development of key IT staff, professionally and personally, will ensure your IT infrastructure is supported efficiently and that major disasters are avoided or averted quickly. The problem many businesses face is the need to rush new technology in without first training their teams to support it. 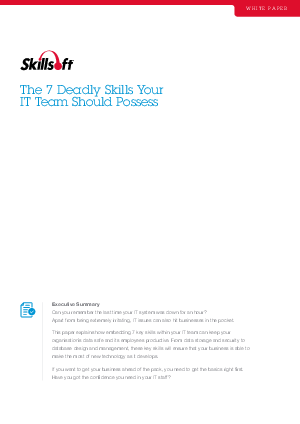 Download this whitepaper now to discover the 7 deadly skills that your IT team should possess in order to support your infrastructure effectively.